(From L-R) Mr. Rohit Sharma, CEO of INTI International University & Colleges with Sanjay Sidhu, Executive Director at BDO Kuala Lumpur. These rising concerns coupled with the fact that almost 200,000 fresh graduates are unemployed, INTI commissioned a landmark survey between 316 employers and new graduates in Malaysia to better understand the demands of the increasingly competitive job market. Survey findings revealed several gaps in expectations between employers and new graduates in terms of the competency deemed essential to excel at a job. The most pressing dichotomy in expectation concerned digital literacy, where 30% of employers regarded it as the most essential competency needed for job performance while most graduates rated it as the least important competency at only 4%. (From L-R) Freda Liu, Moderator of Panel Discussion; Mr. Rohit Sharma; Mr. Gopi Ganesalingam, Vice President, Enterprise Development Consulting at MDEC; Mr. Simon Si, Head Regional Communications, SEEK Asia; and Mr. Jake Choy Yew Wing, an INTI alumnus who is currently a Business Development Consultant (ASEAN) in Oracle during the panel discussion. To further deliberate on the findings as well as discuss remedies that could improve the employment scene in Malaysia, a panel discussion was held alongside Sharma and industry partners including Mr. Gopi Ganesalingam, Vice President, Enterprise Development Consulting, Malaysia Digital Economy Corporation (MDEC); Mr. Simon Si, Head Regional Communications, SEEK Asia; and Mr. Jake Choy Yew Wing, an INTI alumnus who is currently a Business Development Consultant (ASEAN) in Oracle. (From L-R) Mr. Rohit Sharma, Mr. Jake Choy Yew Wing, Mr. Gopi Ganesalingam, and Mr. Simon Si. Another notable finding from the survey is that most graduates (29.5%) regarded communication skills as the most important differentiator while only 6.3% of employers saw it as a differentiating factor in evaluating an employee’s performance. Employers are beginning to raise the benchmark with most seeing communication skills as a given attribute rather than a discerning trait. 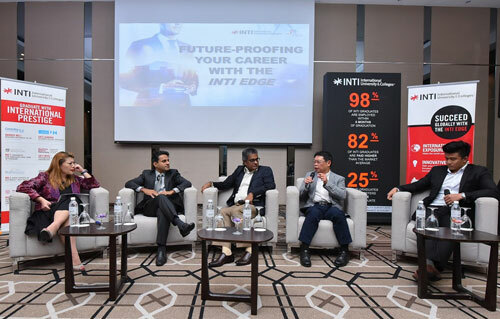 To address the disparities in the survey findings, INTI has launched its new Bachelor of Business programme with specific emphasis on key competencies like digital literacy, entrepreneurial mind set and communications. INTI has also revamped the curriculum to provide more practical exposures through role playing, simulation games, interview and presentation skills, in addition to its existing employer projects and internships. The new Bachelor of Business includes majors in Marketing, Accounting, Finance, Human Resource Management, Business Administration and International Business. 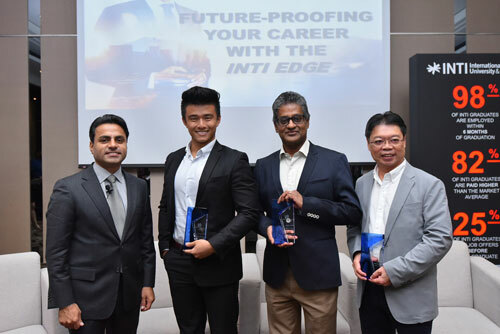 INTI believes that the newly revamped programme will empower students with experience and insights that will give them an edge over their graduate peers – not only in landing jobs but also in establishing careers and also equipping them for lifelong learning. 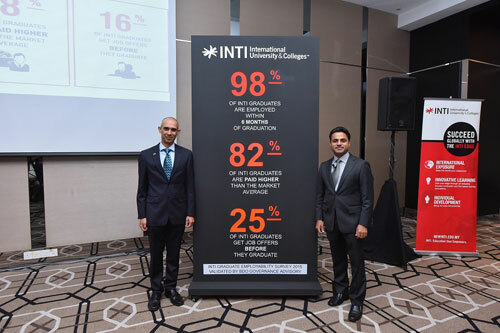 In line with INTI’s unyielding focus in producing outstanding graduate outcomes, INTI and BDO Governance Advisory also launched INTI’s new 2015 employability figures. It is now validated by BDO that 98% of INTI graduates were employed within 6 months upon their graduation while 82% of INTI graduates are paid higher than market average. Additionally, 25% of INTI graduates are offered jobs before they graduate.